Editors' Picks: 20 of the Best Things to Do in New Mexico! New Mexico is an interesting mix of the ancient and the modern. On the one hand, you have some of the oldest Native American ruins in the world. On the other, it's the state that helped usher in the Nuclear Age. You can explore prehistoric natural wonders like Carlsbad Caverns one day and a dazzling array of giant satellite dishes searching for extraterrestrial life the next. Yes, the Land of Enchantment covers the full spectrum of intriguing things to see and do. Here are 20 that you shouldn't miss. It's one of the most unique landscapes on earth, a place where the gypsum sands have built up into ever-shifting dunes. This quiet, eerie place is like being on another planet. This incredible archeological site, a UNESCO World Heritage Site, features an intriguing mix of both small and giant ruins dating back thousands of years. The park allows for camping and hiking, and offers telescopes for some canyon-based stargazing. They weren't kidding with the name: these bizarre, cone-shaped rock formations resemble tents. The area makes for some of the most interesting hiking in the state. There are numerous pueblos around the state, with eight key ones in the Santa Fe area. It's a great way to explore their unique history and cultural significance. The underground landscape found in these caves is truly jaw-dropping. There are bizarre geologic formations, massive "rooms" and dazzling colors. The popular "Big Room" is the size of 14 football fields. 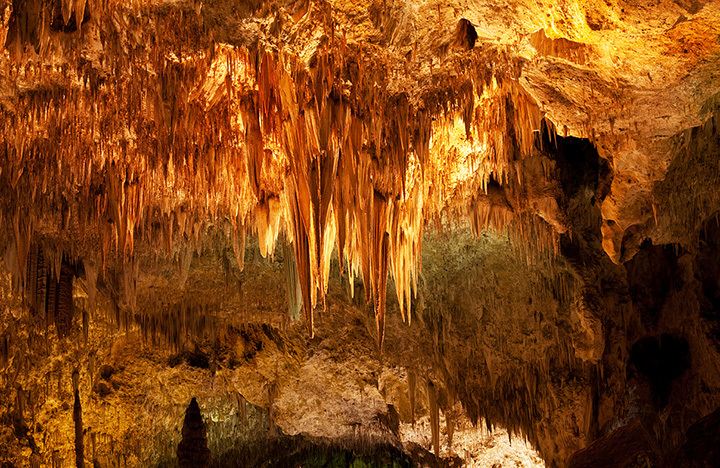 One of the more popular summer events at Carlsbad Caverns is the "bat flight." Watch as thousands of them leave the caves during the evening to chow down on bugs. Hey, a bat's gotta eat. It's the world's largest Native American market, and has taken place each August since 1922. Over 1,000 artists and craftsmen sell everything from weavings and jewelry, to paintings and more. During nine days, about 500 stunning hot air balloons soar into the desert skies. Daytime flights make for amazing photos; the nighttime "glowfest" will blow your mind. This historic railroad offers a great way to see the Western scenery, as it chugs along the New Mexico-Colorado border. It offers breathtaking views, and a sense of travelling back in time. 15. The "Very Large Array"
During the winter months, Taos has an abundance of snow (more than the usual amount in the Southwest). That makes it a perfect destination for anyone in the market for skiing or snowboarding. The Manhattan Project created and delivered "the bomb" that brought WWII to its end. Much of the planning took place here in Los Alamos. The Historical Society offers an intriguing look at this super-secret chapter of American history. If you've ever wondered if we're alone in the Universe, Roswell (reportedly where a UFO crash-landed in 1947) is the place for you. Pretty much the whole town is dedicated to the theme of UFOs and aliens. Get your "X-Files" on. The name is Spanish for "Valley of Life" - and it boasts an abundance of wildlife, including the largest herd of elk in the state. The area has been dubbed the "Yellowstone of New Mexico." Located in the beautiful Sangre de Cristo mountains, there are plenty of opportunities for wildlife-spotting, hiking, biking and more.